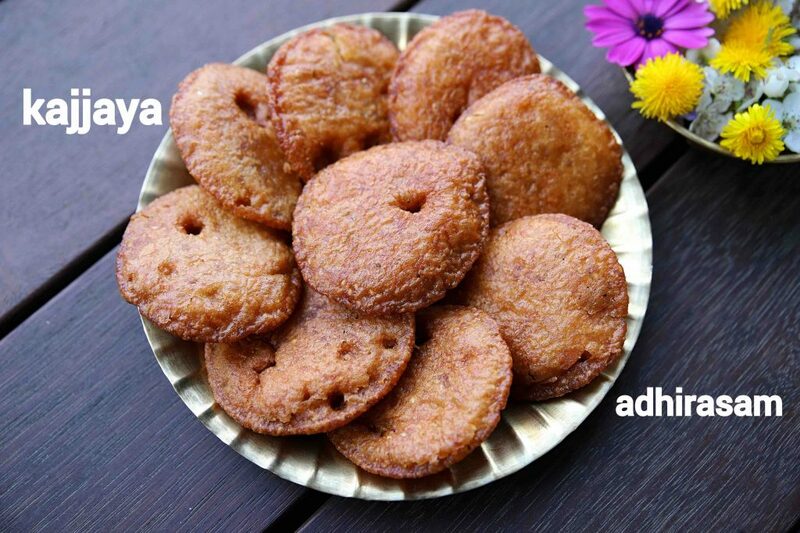 kajjaya recipe | adhirasam recipe | ariselu recipe or athirasa recipe with detailed photo and video recipe. 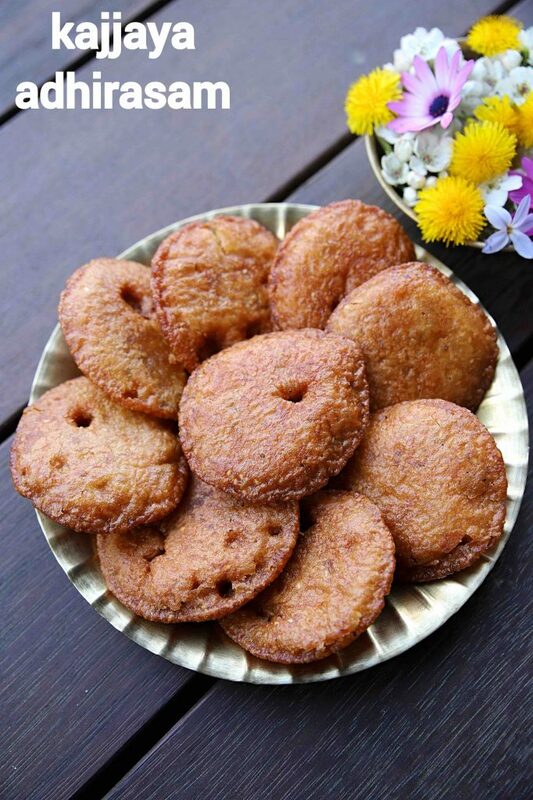 a traditional deep fried south indian sweet recipe made with grounded rice and jaggery. it is a popular dessert recipe made generally during festival celebrations like diwali and navaratri or for any auspicious occasion. it is a tricky recipe, but can be easily mastered with few tips and suggestions. 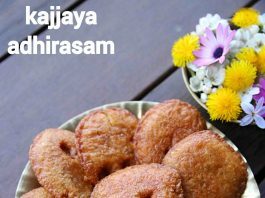 kajjaya recipe | adhirasam recipe | ariselu recipe or athirasa recipe with step by step photo and video recipe. kajjaya or adhirasam recipe is a popular south indian dessert recipe. it is widely known across all states but may differ with the texture and the way it is made in all these states. in this recipe, i have shared the karnataka version made with coarsely grounded rice in a jaggery syrup. as i mentioned previously, kajjaya recipe or adhirasam recipe is not an easy recipe, and can be overwhelming for beginners. as a matter of fact, this is my third attempt, in making this recipe and i was missing with the rice batter consistency or with jaggery syrup. i had to do a lot of troubleshooting and i finally arrived at the desired consistency and shape of athirasa. i personally not a huge fan of this recipe as it requires a lot of effort and time to make it perfect. having said that, if someone makes it for me, i can have this day and night. moreover, while i was experimenting with this recipe, i realised that this recipe is not a healthy one to consume it frequently. especially when it is deep fried, it absorbs a lot of oil, hence i recommend to have this sweet cautiously. 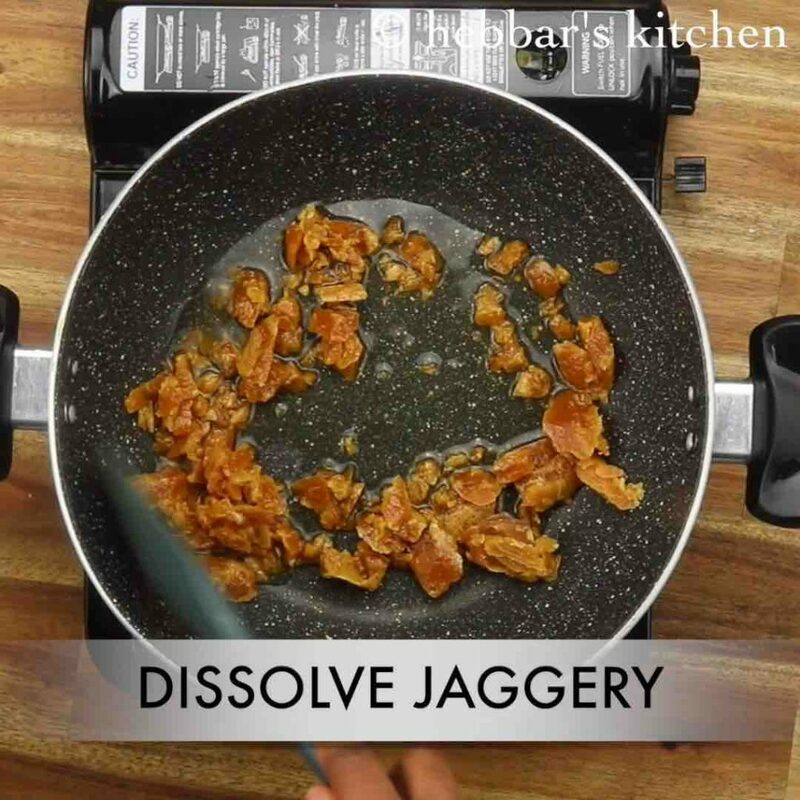 furthermore, i would like to share some tips and suggestions which i learnt while experimenting for a perfect kajjaya recipe or adhirasam recipe. 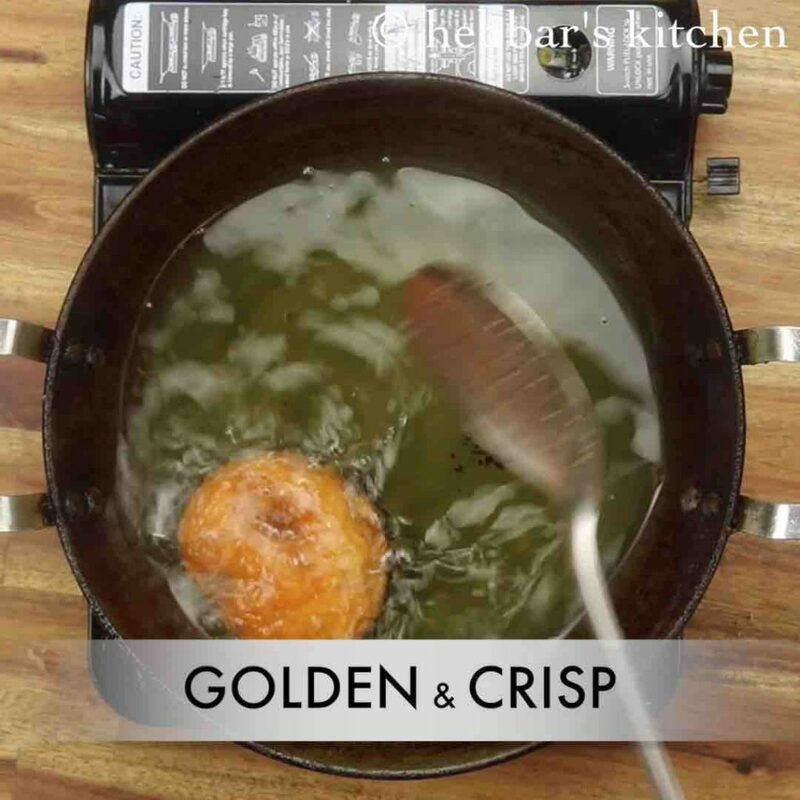 firstly, the recipe is very time consuming and takes a long time in soaking, drying, grounding and also deep frying. hence patience is very key for this recipe and do not lose your motivation. 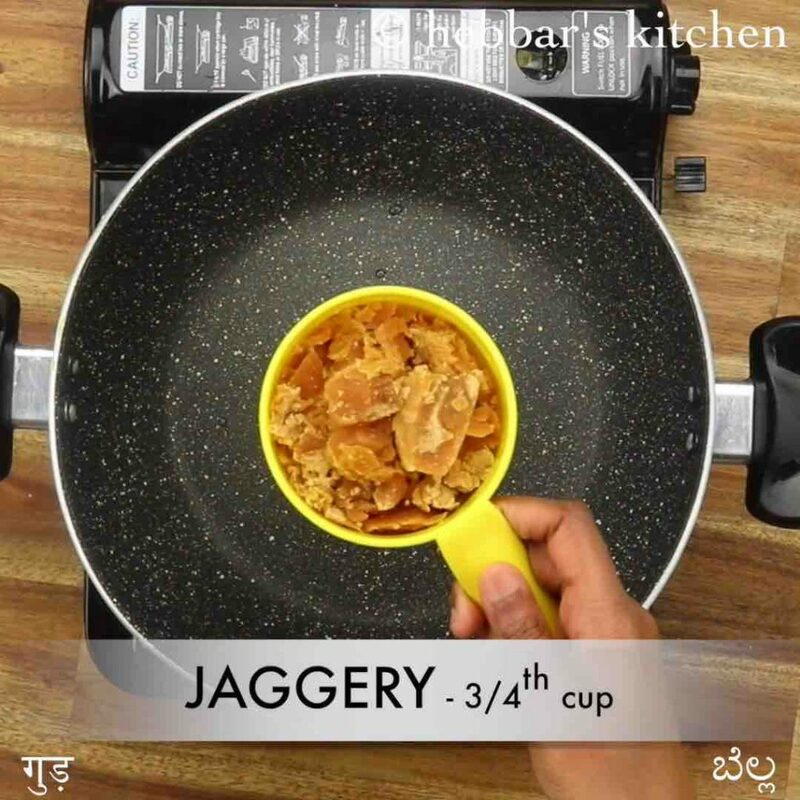 secondly, the consistency of jaggery syrup is the key for this recipe. 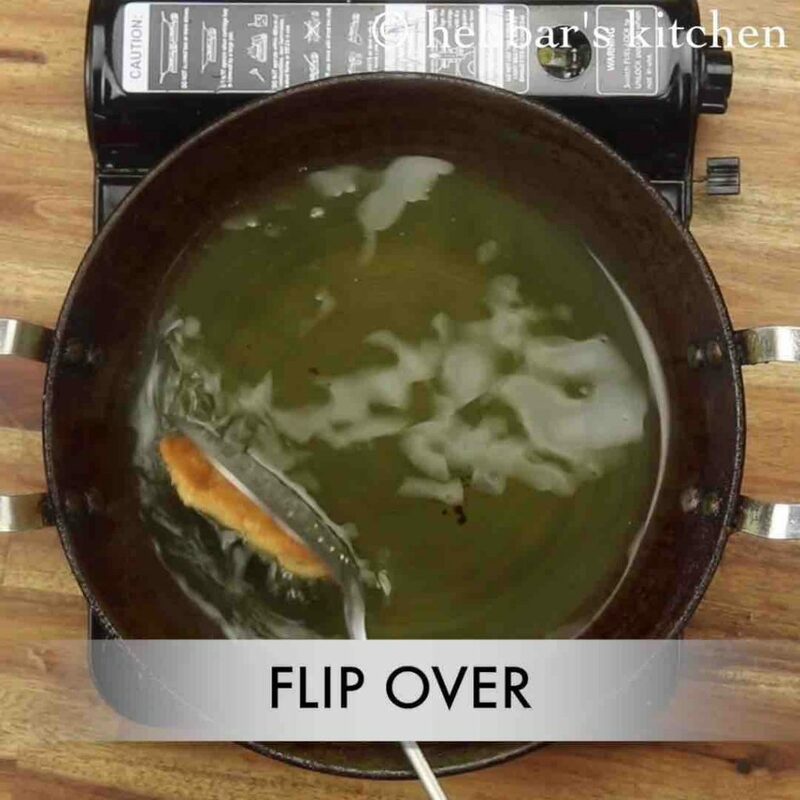 if you fail in it, the batter may dissolve when deep frying in ghee or oil. lastly, athirasa has to be deep fried in a low to medium heat oil. do not compromise on this otherwise, it may not form the desired shape. 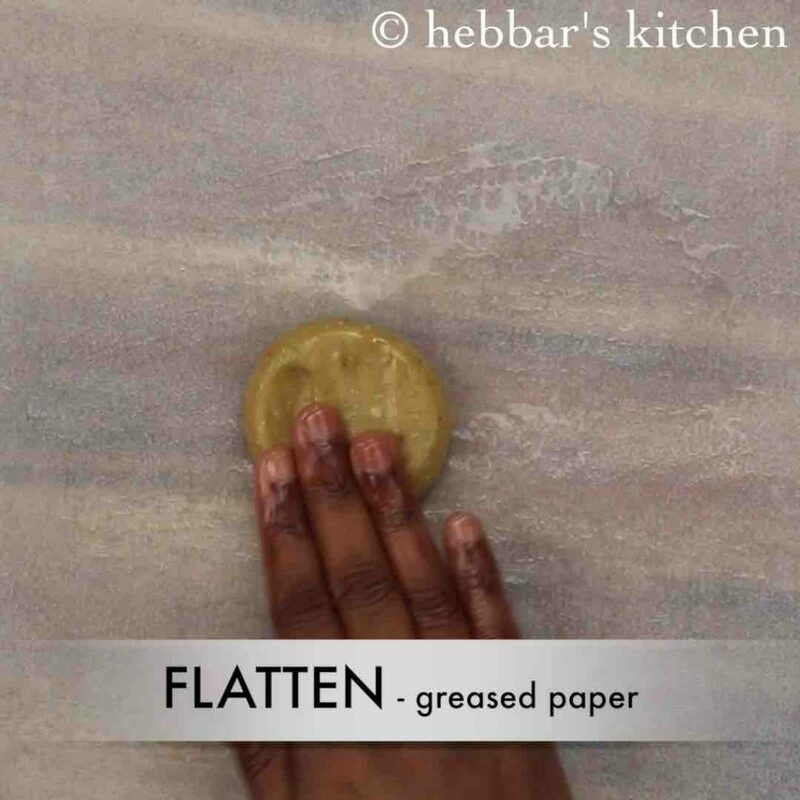 grease the butter paper (or plastic sheet) with oil and pinch a small ball sized dough. pat and flatten to form a slightly thick disk. 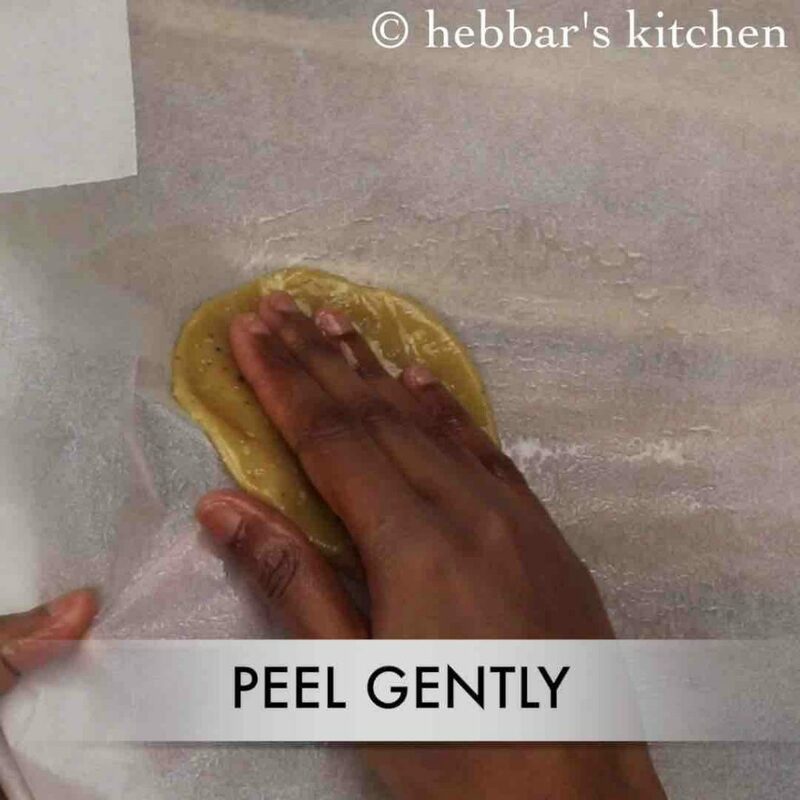 peel the athirasa gently, without breaking apart. 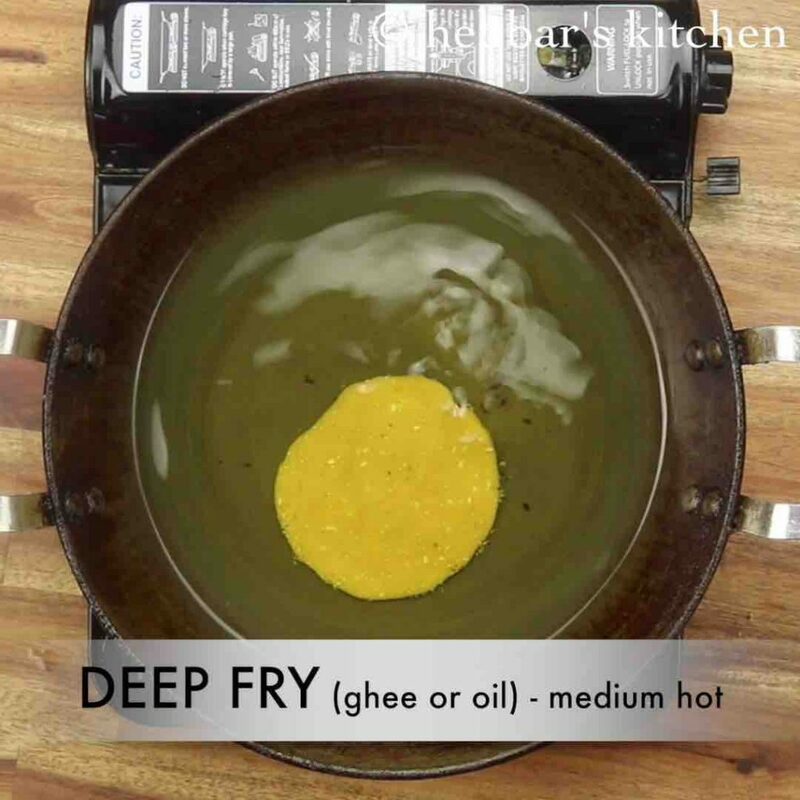 now deep fry in medium hot oil or ghee. fry on medium flame until the bottom part is cooked well. 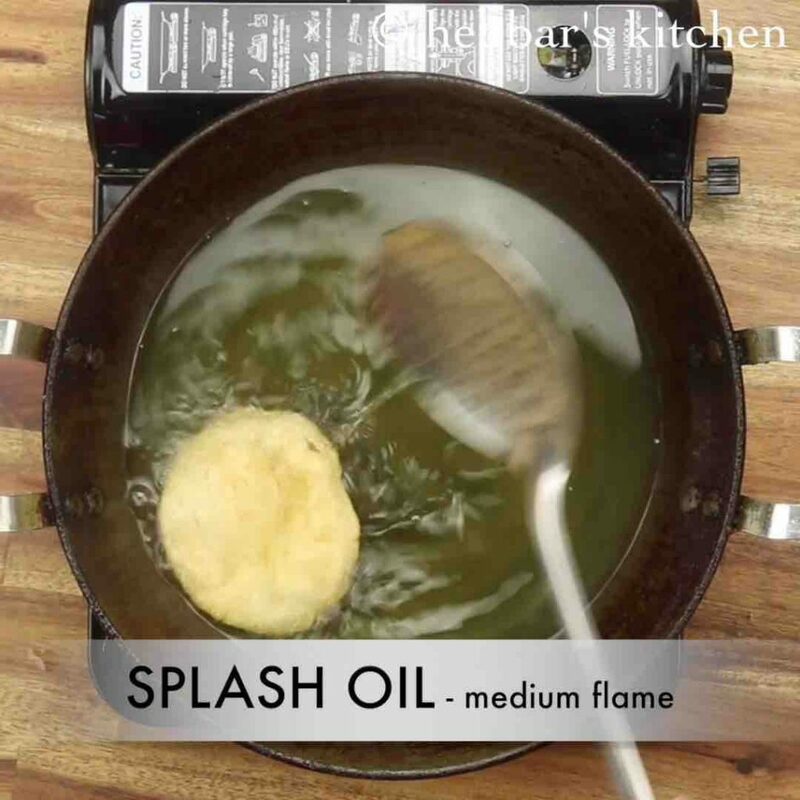 keep splashing oil on top to cook evenly. now gently, turn over the athirasa, and fry on both sides. 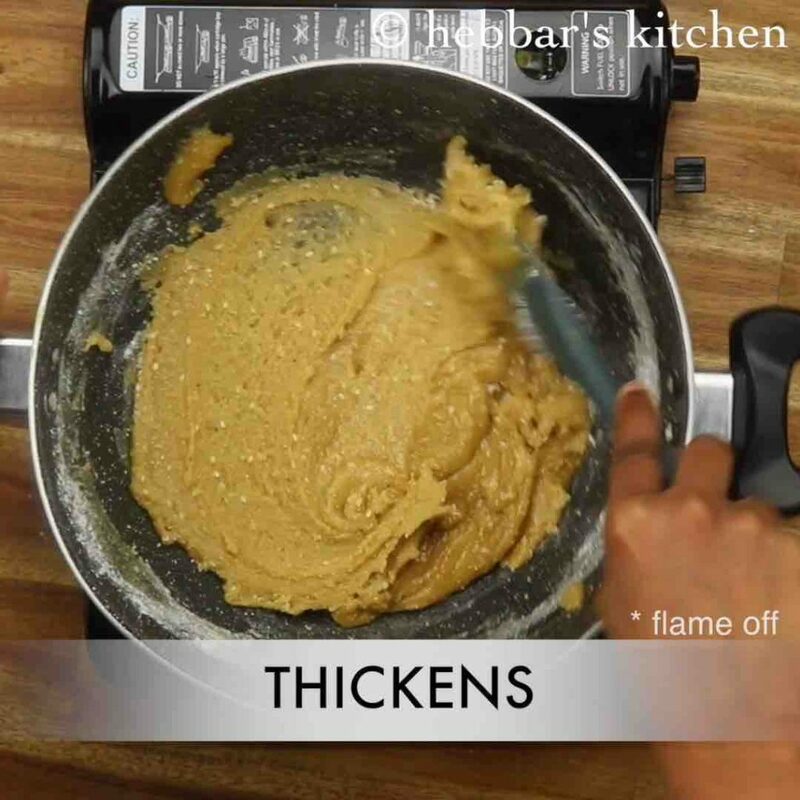 fry until both the sides turn golden and slightly crisp. 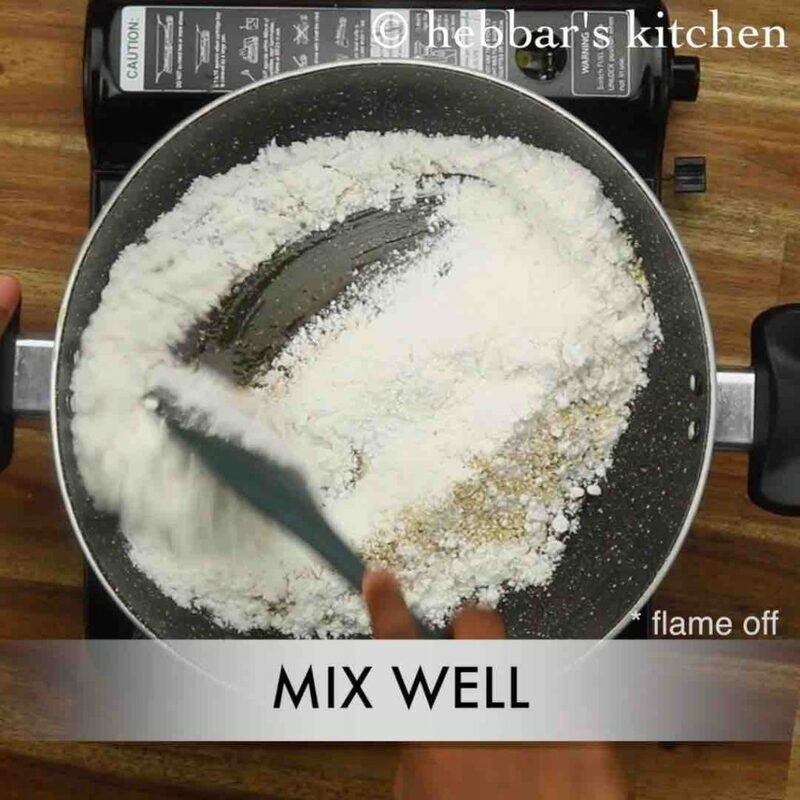 do not fry too much, as the adhirasam will burn and turn black. slightly press the athrasa to remove of excess oil. finally, enjoy athirasa / adhirasam for 2 weeks by storing in an airtight container. firstly, soak 1 cup rice and soak for 4 hours. 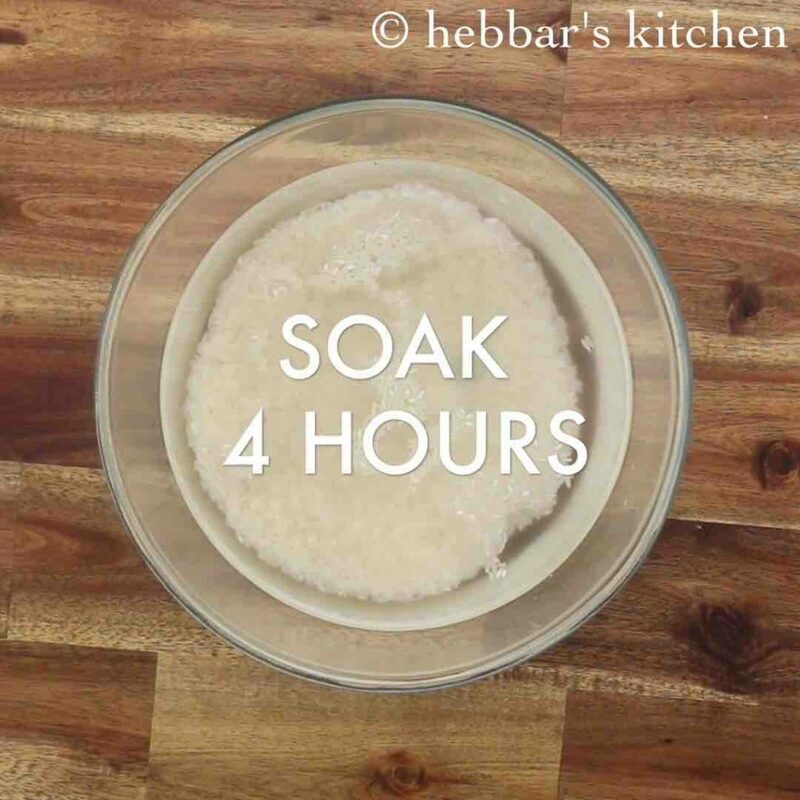 you can alternatively soak overnight by changing water every 4 hours. drain off the water and spread over dry cloth. 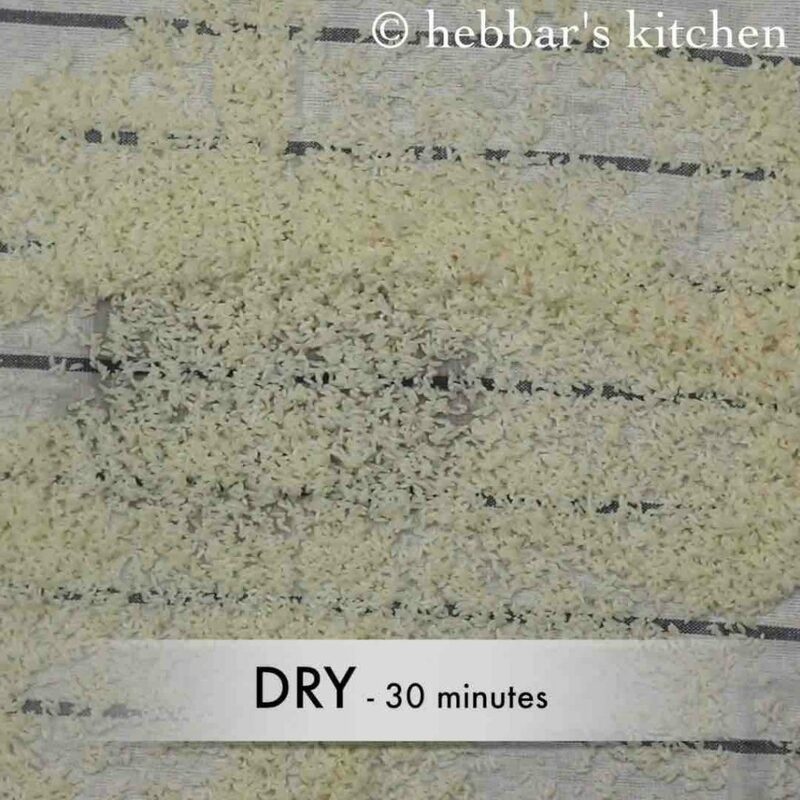 allow to dry for 30 minutes. 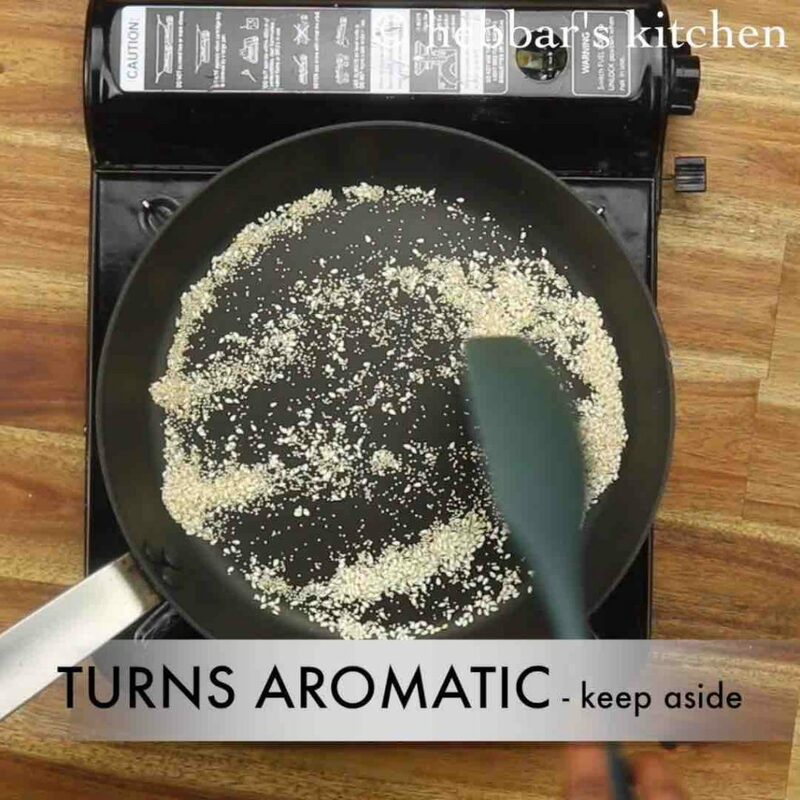 make sure the rice is still moist; do not dry completely. 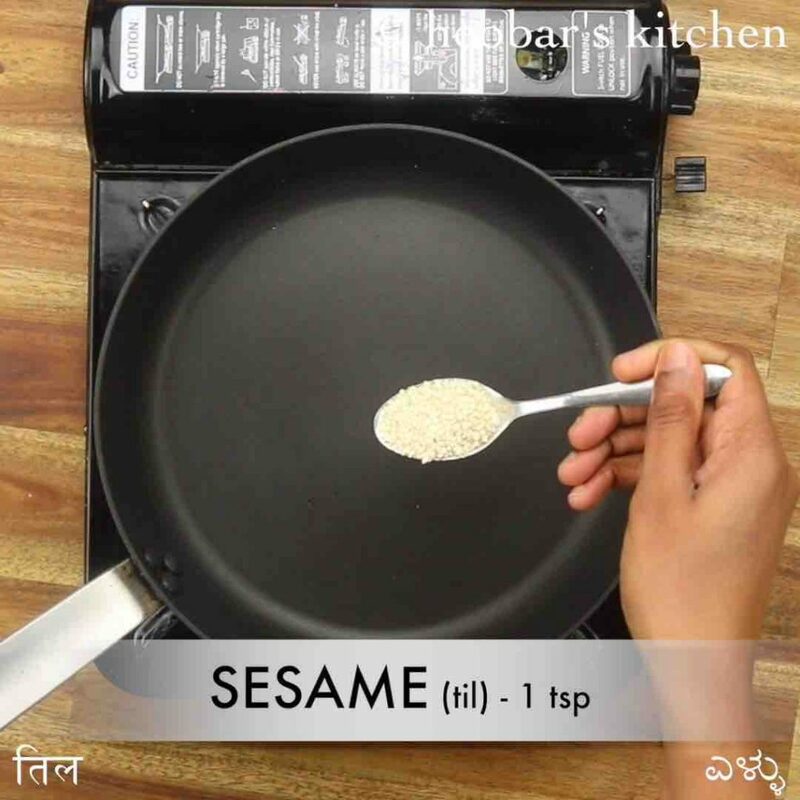 now transfer the rice to a mixi and blend to fine powder. 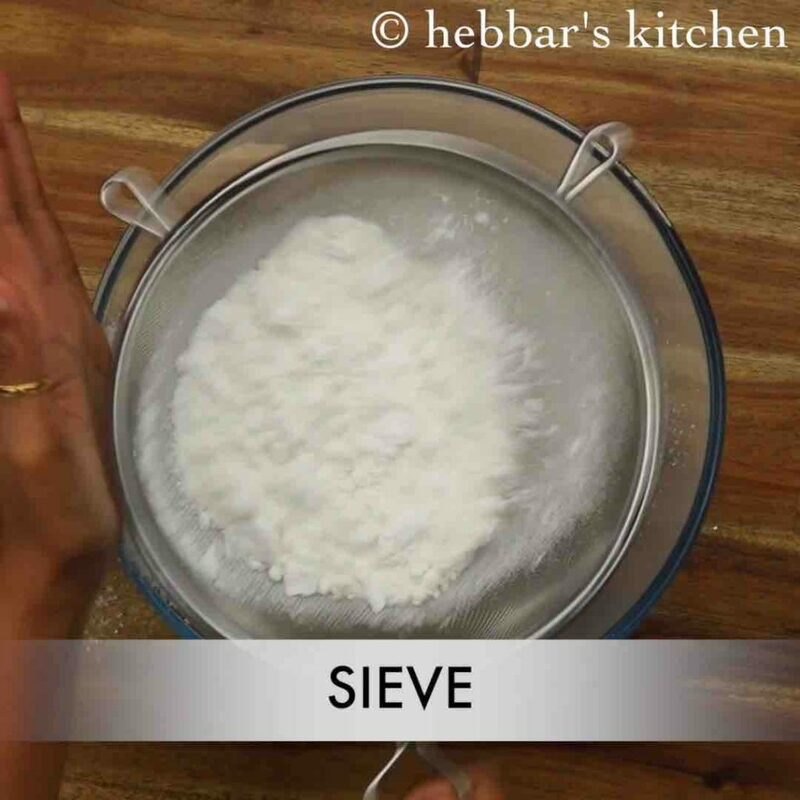 sieve the rice flour, making sure there are no traces of rice grains. keep aside. now in a tawa dry roast 1 tsp sesame seeds and 1 tsp poppy seeds. roast until it turns aromatic. keep aside. further, in a large kadai take ¾ cup jagger and ¼ cup water. 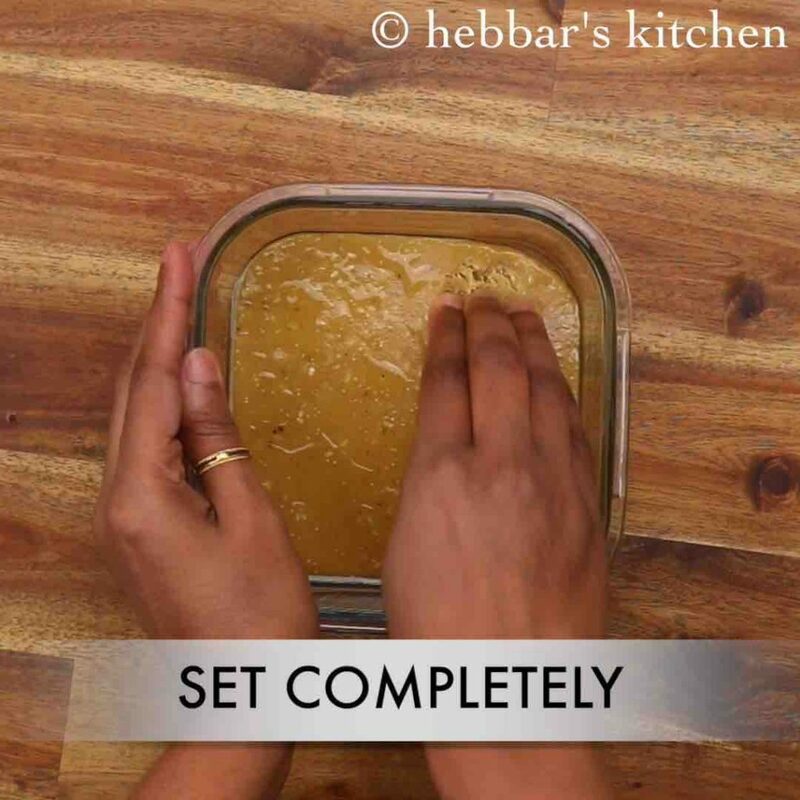 stir well till the jaggery melts. 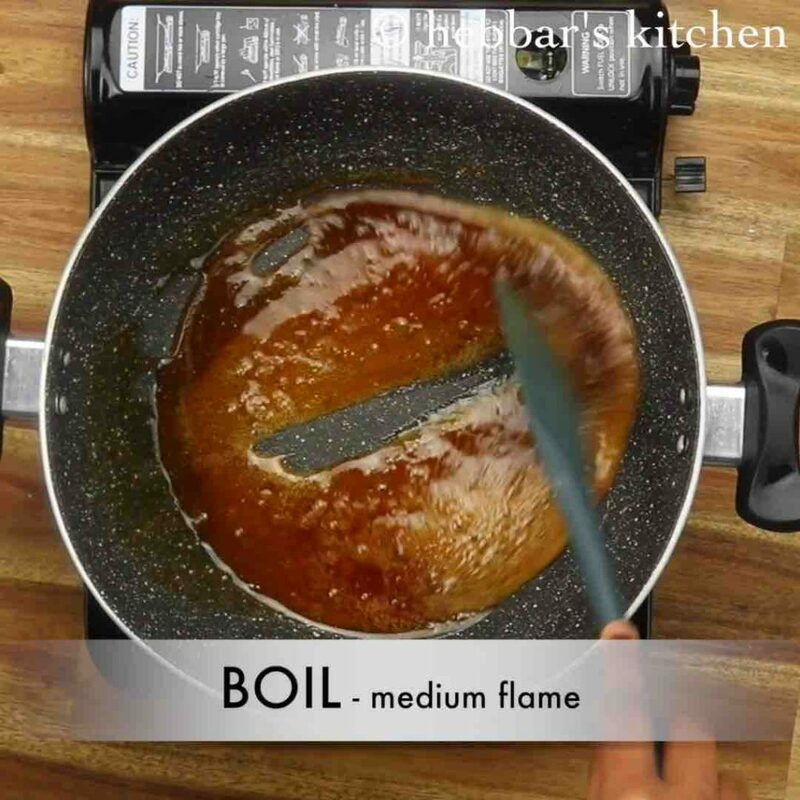 boil the jaggery syrup on low flame for 5 minutes. 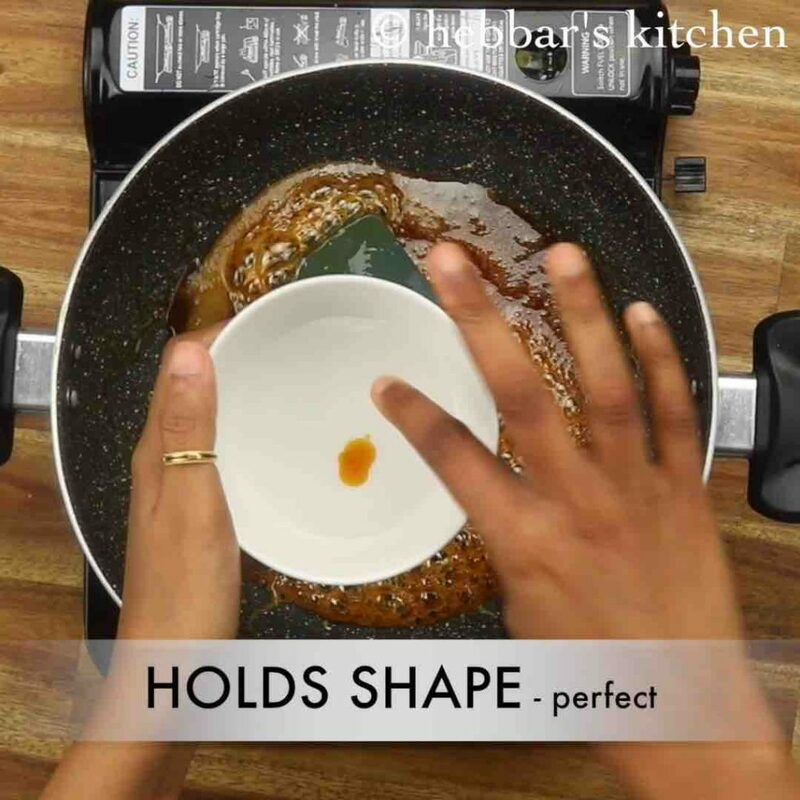 check the consistency, by dropping syrup into a bowl of water, it should form a soft ball. else boil for another minute and check. 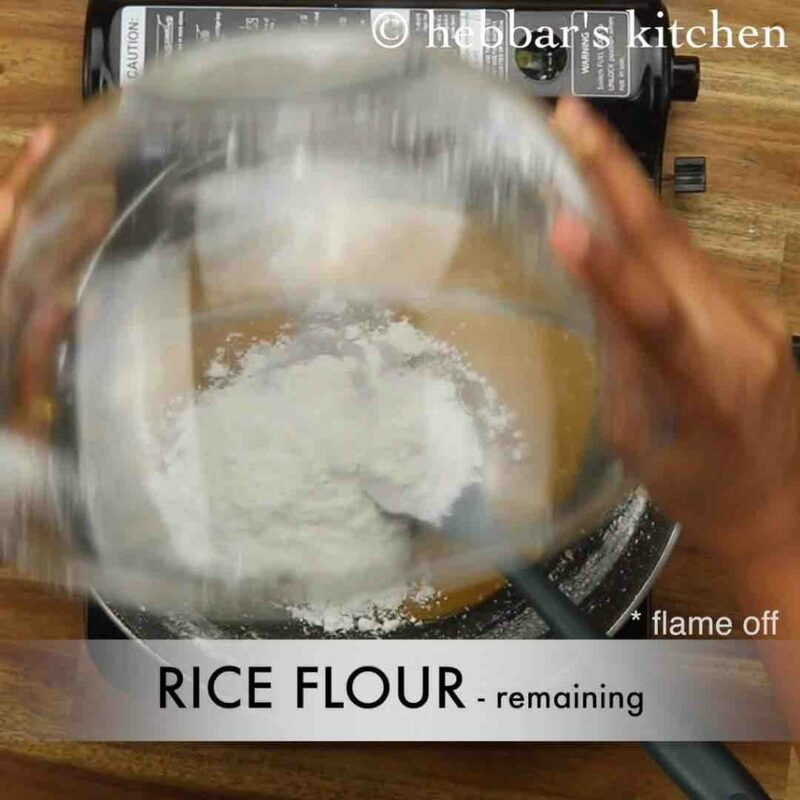 now turn off the flame add add prepared rice flour in batches. 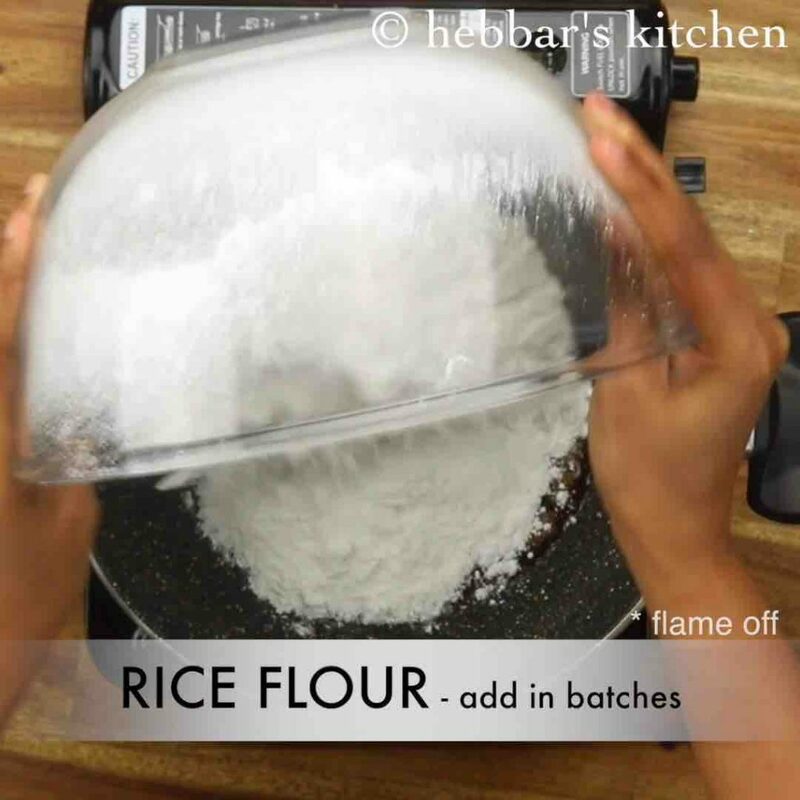 do not add entire rice flour at once as it may be difficult to mix. 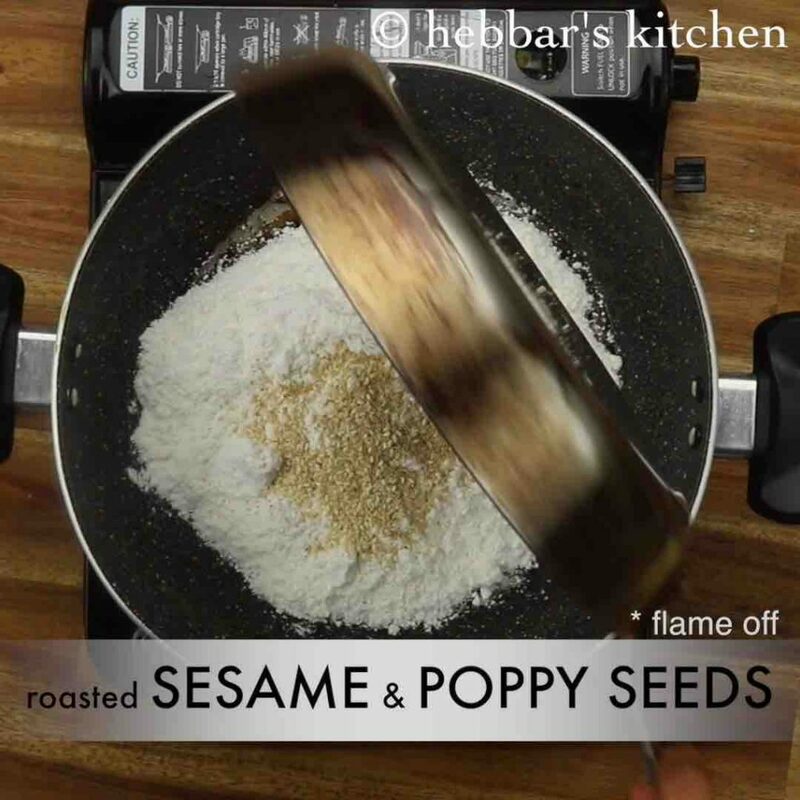 also add roasted poppy seeds and sesame seeds. 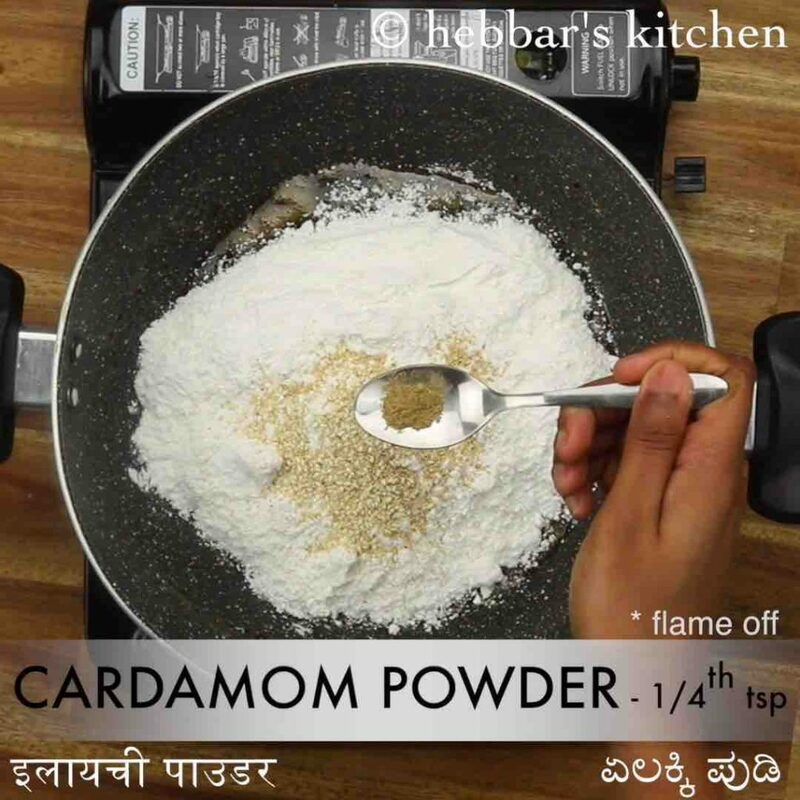 furthermore add ¼ tsp cardamom powder and ½ tsp pepper. mix well, making sure everything is combined well the mixture will turn watery as there is moisture in rice flour. additionally add leftover rice flour and mix well. the mixture will starts to thicken and hold shape. 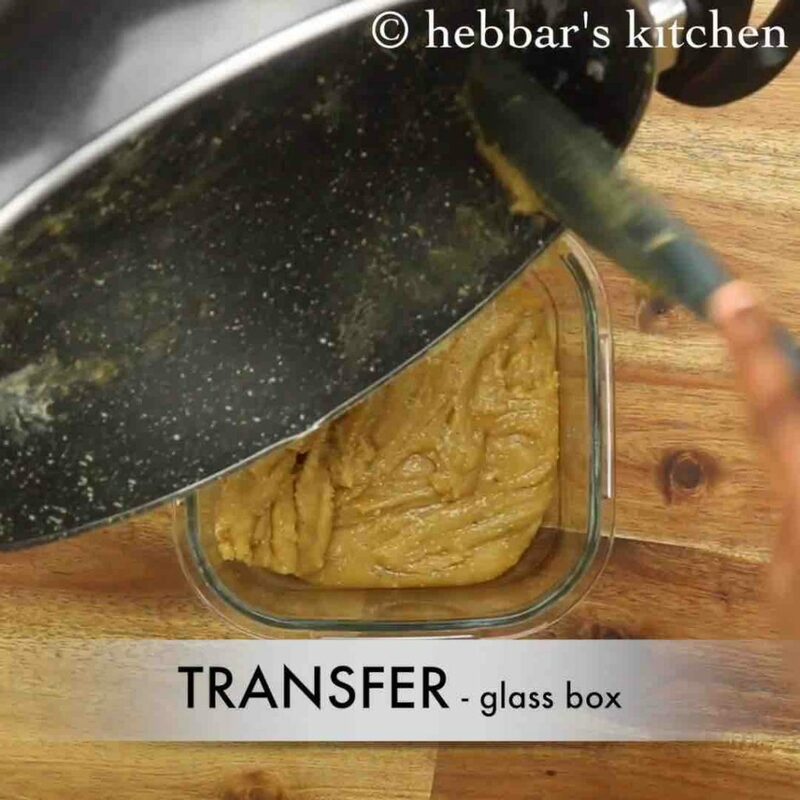 transfer the mixture to a glass bowl. 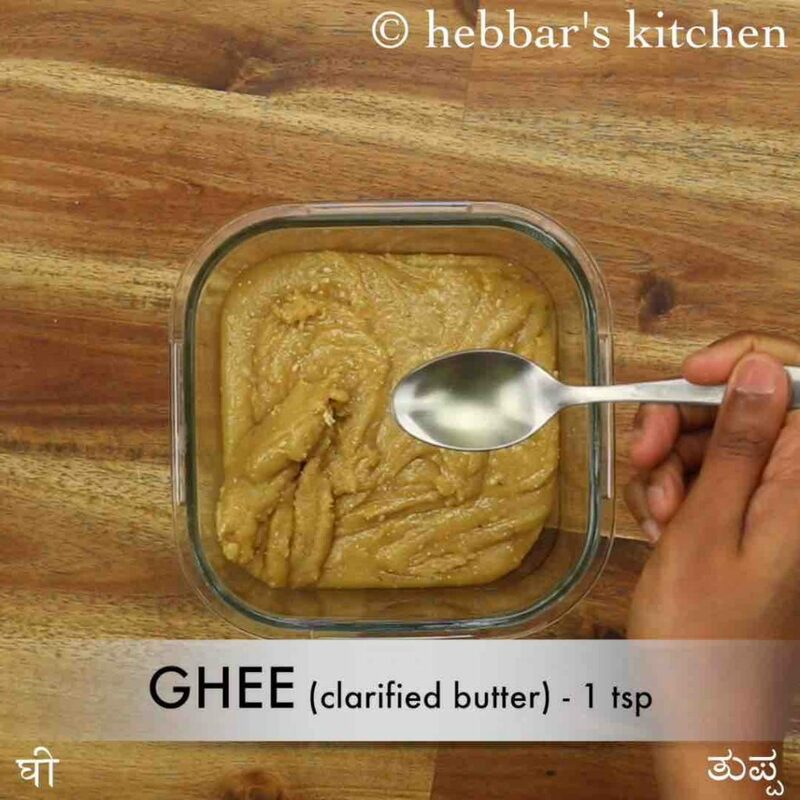 grease the mixture with oil or ghee to prevent from drying out. cover and rest for 12 hours making sure the dough sets completely. 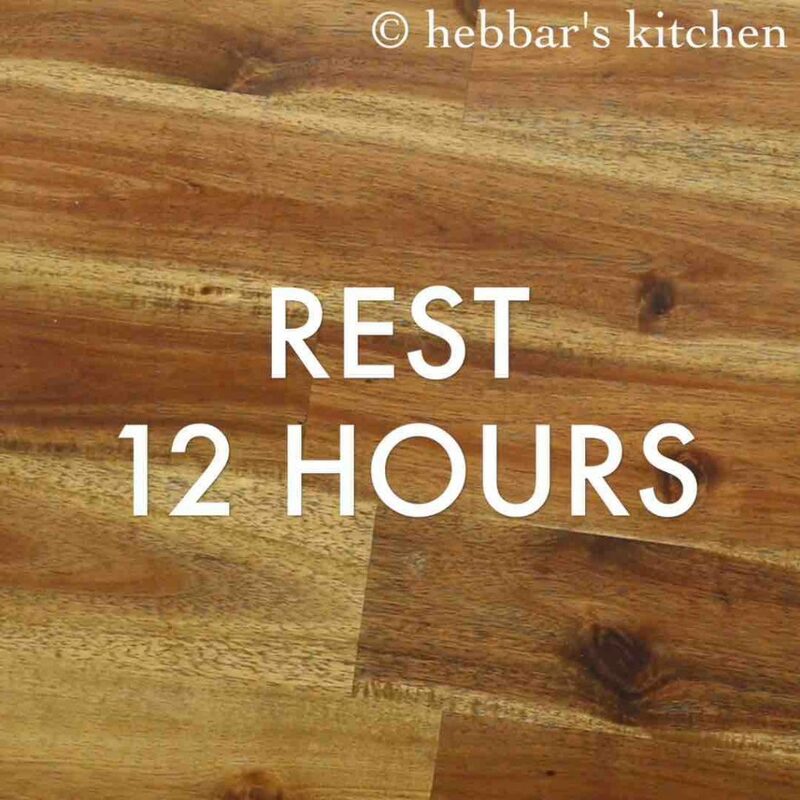 after 12 hours, combine to form a soft dough. if the dough is too hard, mash a banana and combine to form a soft dough. 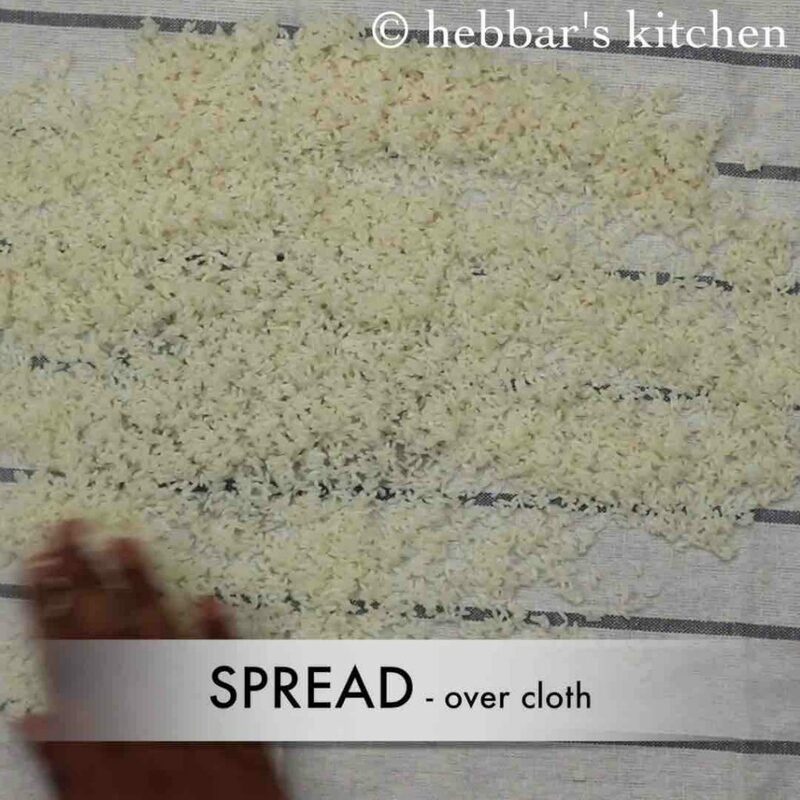 if the dough is watery then add a tbsp of rice flour to form a soft dough. 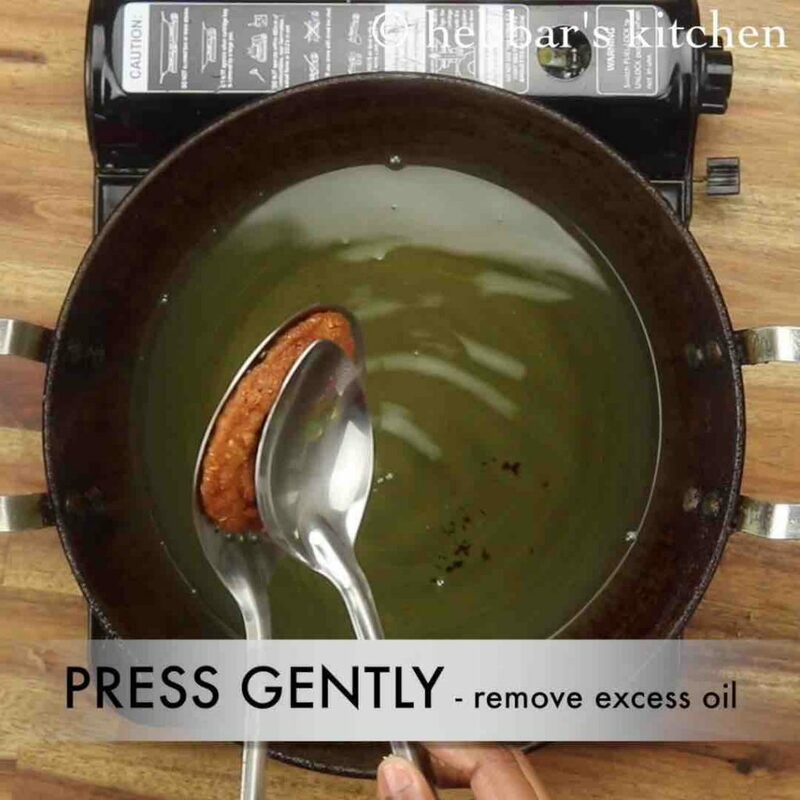 slightly press the athirasa to remove of excess oil. finally, enjoy kajjaya / athirasa / adhirasam for 2 weeks by storing in an airtight container. 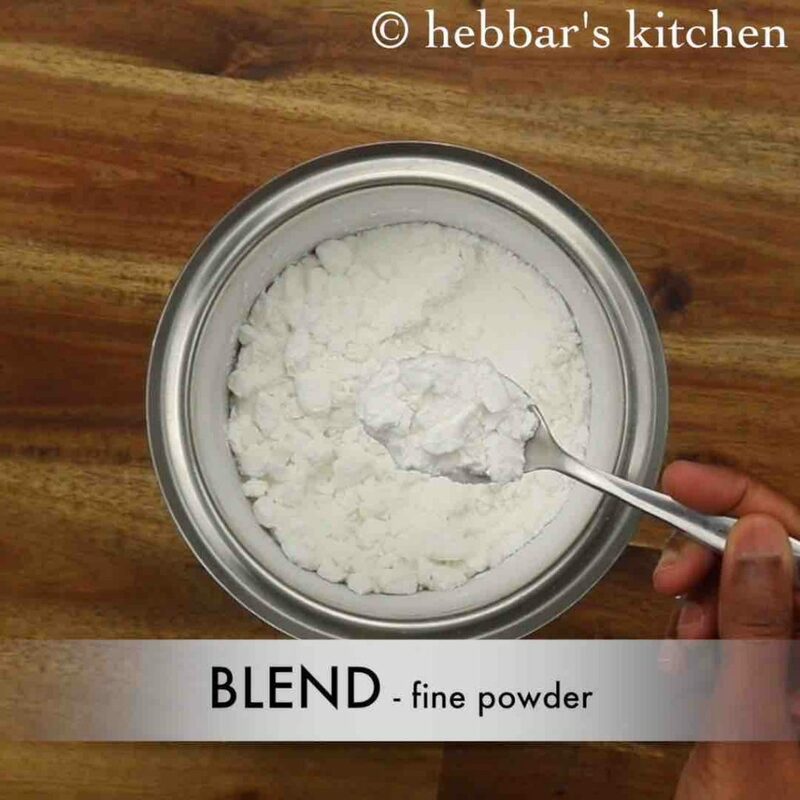 firstly, make sure to blend rice to fine powder and do not use store brought rice flour. also, follow the ratio of rice and jaggery. do not increase or decrease the proportion. 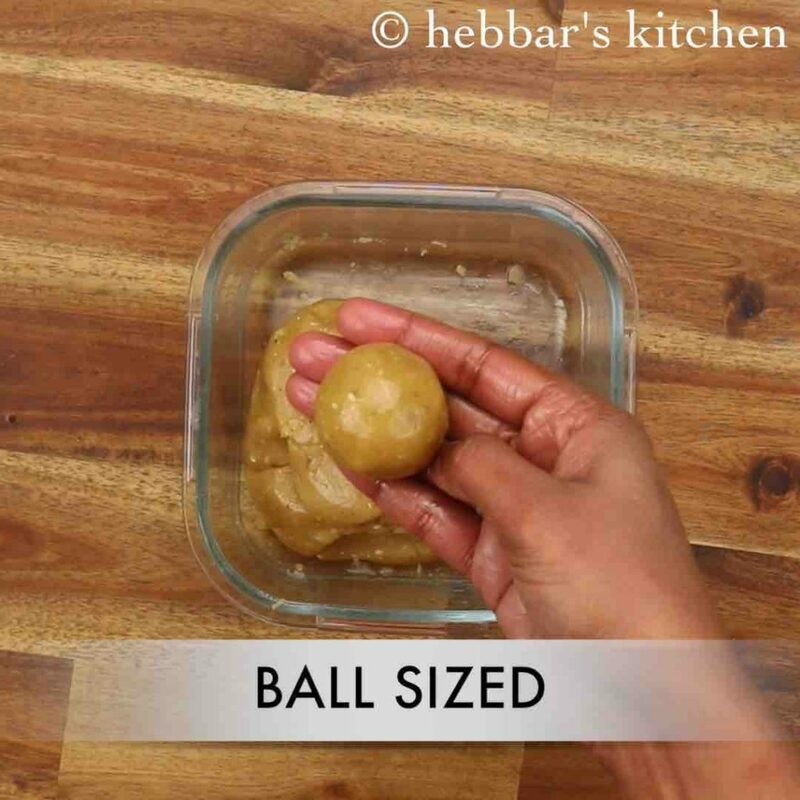 furthermore, store the dough in airtight container for a month or more and prepare adhirasam as required. additionally, if the dough splits in oil, do not worry. just add a tbsp of maida and prepare the dough. finally, kajjaya / athirasa / adhirasam recipe taste great when fried in oil.